Jeff Goldman is obsessed with dump trucks. He just can’t stop thinking about them. Questions like, ‘Where are those trucks barrelling down your rural road and hogging the passing lane along the King’s Highway going?’ and ‘Where did they originate?’ are constantly running circles in his brain. Some might tell him, ‘Hey Jeff, get a life! Why waste your time concerning yourself with something as unglamorous as dirt?’ But Goldman, principal of Durham Custom Homes, is here to convince you that it’s time we all got the ‘dirt’ on dirt. All these capital investments and infrastructure projects are good news for the economy and the home building industry. What it means, however, is that there is a lot of dirt lying around, with several million truckloads displaced each year. And all that earth needs to end up somewhere, which is where problems are arising. “We as builders and developers need to be better informed on this issue and get in front of it by educating our membership and taking appropriate action,” says Goldman. 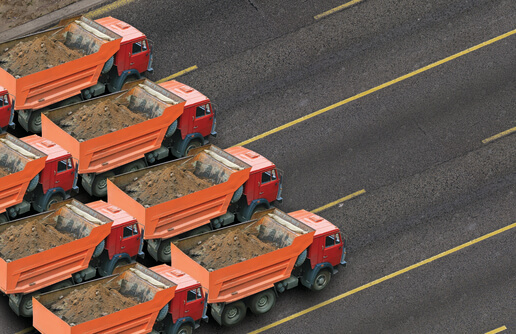 In Ontario, the transportation of excess soil is done almost exclusively via those fuel-guzzling trucks that, due to inconsistent municipal regulations, are asked to travel greater distance between sites each year. The amount of soil one truck can transport depends on both on its size and the nature and weight of its load. “While the amount of excess soil to be removed from a site is calculated in cubic metres, truck haulage is licensed by weight,” explains Goldman. Take a moment to digest the numbers: Tens of millions of cubic metres of excess soil are moved within the Greater Golden Horseshoe Area each year. This movement involves millions of truckloads annually—the average one-way distance travelled by haulage trucks being 70 km. The aggregate costs are at least in the hundreds of millions of dollars per year. Any large building project—houses, factories, roads, hospitals, large office towers—they all involve the disturbance and the displacement of dirt. For each there is either too little soil or too much. More often than not, it is the latter—and a lot more than can be repurposed for landscaping. What’s a builder to do with increasing restrictions and varying regulations that differ from one municipal border to another with increasing regularity? In Goldman’s research, he discovered that there are 135 agencies involved to some degree in excess soil management. Outside the home building industry, the issue impacts the agricultural sector, quarry operators, waste management operators, municipal planners and land surveyors to name just a few. Besides the Ministry of the Environment and Climate Change, there are at least another half-dozen ministries with an interest in this issue. How can one possibly learn all of these rules? The provincial government is trying to reel in the municipalities and various governing bodies to provide some guidance, structure and consistency on the issue. On January 26, 2016, the Ministry of the Environment and Climate Change (MOECC) released a proposed Excess Soil Management Policy Framework on the Environmental Registry for a 60-day period of consultation. This followed a previous consultation back in 2013 (Soil Management Guide for Best Management Practices, 011-7523). The two main goals of the proposed new policy are to protect human health and the environment from the inappropriate relocation of excess soil and enhance opportunities for the beneficial reuse of excess soil. In principle, OHBA supports both these broad objectives. The concern is that these proposals seek to shift more responsibility for excess soil on to those who generate it. Chris Lompart, Manager of Land Use Policy at the MOECC, is one of the government employees leading this policy consultation. Leading up to the release of the Excess Soil Management Policy Framework, Lompart says his group had approximately 14 detailed consultation sessions with a variety of stakeholders, conducted internal research and followed up this initial work with further consultations and workshops. Following the release of the draft document this past January, MOECC received about 100 submissions, including many from OHBA and its members, reacting to its draft proposals. 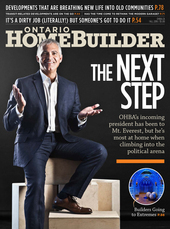 Michael Collins-Williams, OHBA Director of Policy, says it is time for OHBA members to recognize the extent of the issue. He acknowledges the current model in place does not serve anyone’s best interests. “We hope with provincial involvement there comes a robust framework that ensures municipal bylaws are more consistent,” he says. The proposed framework would require new regulatory requirements on source sites to prepare and implement excess soil management plans, certified by a qualified person, Collins-Williams notes. That means OHBA members must retain qualified professional consultants for each new project to help develop an Excess Soil Management plan. And the additional proposed requirements will increase timelines, complexity and costs, including potential additional laboratory analysis for handling excess soils, not to mention the potential for uncertainty arising from new requirements for the issuance of certain building permits and linkages to applicable Planning Act approvals. “OHBA has been consistent in outlining concerns that would increase costs and complexity of soil management as both a barrier and constraint to opportunities for remediation, reuse and intensification,” Collins-Williams adds. However, David Harper, president of Kilmer Brownfield Management and a specialist in remediation and risk management, fears overregulation could hurt, not help the industry. In his 13-year consulting career, Harper, a professional with the Association of Geoscientists of Ontario (P.Geo) and recognized as a ‘Qualified Person’ under Ontario’s brownfield legislation, has weighed in on more than 200 brownfield projects. Harper says the provincial government’s increasing involvement in the issue over the past few years is a positive thing. But as the MOE has taken on a larger role in guiding regulations to support the initiative, a Catch 22 emerges. While the supply of excess soil continues to rise, the choices of where to deposit it becoming fewer and fewer, leaving developers to travel further and further down the road to find a suitable receiving site. The quandary, further exacerbated by increased regulation and inconsistent municipal bylaws, has led to an increase in the ‘dirty’ side of this business—a.k.a. illegal dumping. And then there‘s the NIMBYism aspect. Residents, especially in rural communities surrounding the GTA, are not happy with the noise, nuisance and dust created by dump trucks rolling into their municipalities and across their borders. Due to pressure from citizens, municipalities have drafted and enacted bylaws—rules that invariably differ from the ones followed by their neighbouring communities. OHBA is concerned that neither the current nor the proposed legislative regulatory framework are well designed to address those large-scale boundary issues presented by the movement of excess soil across different jurisdictions. The lack of provincial-level oversight has left the management in the hands of municipal bylaws and conservation authority regulatory oversight. Andy Manahan, Executive Director, Residential and Civil Construction Alliance of Ontario (RCCAO), believes that MOECC involvement is necessary to level the playing field. Like Harper, the RCCAO is tired of the waiting game of constant consultations that drag on for years without any resolution. “Our No.1 suggestion is to just get on with it,” Manahan says. The RCCAO would also like to see the government look to other jurisdictions that are leading the way, such as the United Kingdom, which has developed proven measures that see regulators and the industry work together to advance excess soils handling approaches in a cost-effective manner that also have a market-based focus.